What on earth was it? Light bulb moment! It is our little armed ones – Armadillos! What a wonderful surprise. Here is a link to a short video of their distinctive chirrup. Can you imagine that little noise, all night long, from our extended Latin American immigrants? They wake up about 7 pm and start chirruping, ‘Bee Bee?” Teddy responds, “Beeee Beep?” and on it goes. Then I started reading about them. They like to dig burrows and they are all still under the deck including a new one. Curiously, they are happy to share their tunnels with skunks, possums and whoever else is there. Happy hippy commune, man! They aren’t predated by the Great Horned Owl but presumably they were all cuddled under the deck with skunks. Maybe their chirping was meant to be reassuring? They have very few predators and can live from 9 to 23 years. That probably means that we have lived with the same extended family for the last 13 years. Mami, Papi, Abuelita, Mijos – no wonder they talk with us. We are THEIR people; not the other way around! Even better, they are insectivores and LOVE fire ants. Now I love my little armed ones with a passion… For some reason fire ants love to bite me. You are innocently gardening when one and then one hundred fire ants run up your leg, biting as they go. Your only recourse is to run to the outside faucet and rinse them all off. Then you get some lidocaine because it bloody hurts! Armadillos are funny looking little creatures but harmless unless you eat them undercooked (yes, people are hungry in Central America). Then you can contract leprosy from them – how weird is that? We would start naming them but Teddy counted about 50 one night, all communicating with each other. Imagine a busy barrio in Mexico. Some years ago, Teddy got this wonderful little video of some baby armadillos snuffling about in the undergrowth looking for insects. They were silent and when I have seen them in our garden they went straight under the deck – they didn’t seem scared though and now I know why. It was their female person. You are most welcome! Are you based in San Diego? Visiting next week. Kerry, we live three hours from San Diego but the boat is in San Diego. Are you guys on vacation in San Diego,,I could probably recommend some great places. I am just going for a couple of days for R & R. Finding some ancestors’ gravestones in the old part and staying in Gaslight for good photos. You’ll get great shots there, but make sure to shoot the bridge and go up to the Point Loma Lighthouse, where it’s haunted and there’s great pics. Adorable. I’m so envious of you, having so many neighbours. Thank you so much! It would only work if you wore earplugs. Teddy snores…loudly. The Cicadas are the loudest of them all. Ah, cicadas. Ours are very noisy on summer days, but they hush-up at night. I’ve never seen an armadillo but cicadas have kept me awake on many nights. Our armadillos are wishing us good night right now as they settle down to sleep under the deck. I love the alien sound of cicadas. Lawns are so passé… 😁 Why don’t you build them a deck and put lots of mulch down for them like any normal person would??? Ha! Point well made. Clearly they’d never had it roasted in the oven, tossed with some olive oil, fresh ground pepper, and sea salt. The armadillos would love that – make sure you serve it on china! And with a smattering of grubs for garnish. 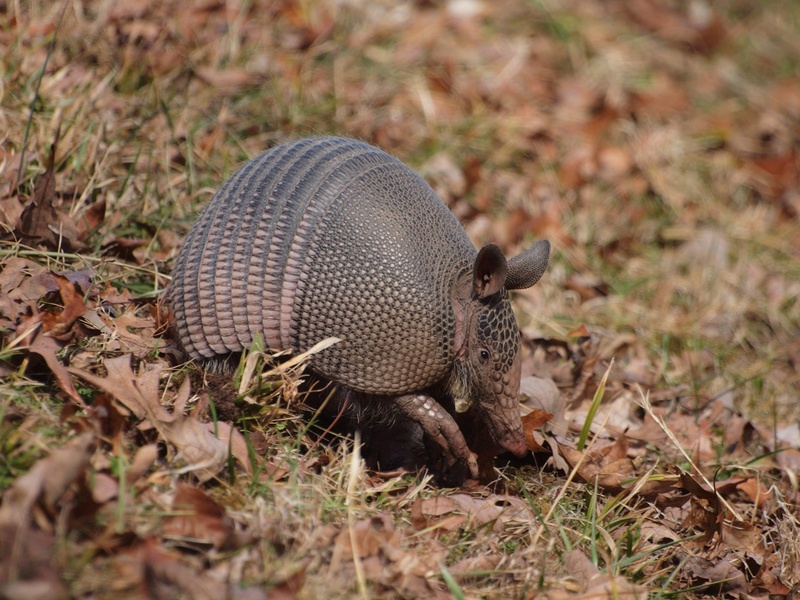 Now you are an armadillo whisperer…. Great post Kerry. I wish you could see some of the wild life here in Kenya. Monkeys mainly. I’m sure they don’t … HB2 might be nagged to move south on account of this fact 😆 Bee beep little Dillos. ❤️. 💤. PS: I want an armadillo emoji at least!! My life is (almost) complete!!! Fire ants!!! Ahhh! Vinny once ate a piece of hot dog off the ground in Georgia COVERED in fire ants before I could stop him! His poor little mouth had dozens of pimples for days! Armadillos are now our favorite critter but I have noticed they have moved on temporarily in search of food. Come back, we miss your chirps! They only eat insects but we have had a rainstorm which softens up the soil and they may return tonight.